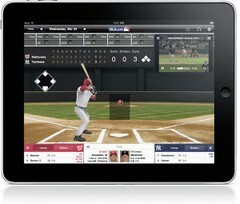 The MLB’s approach to digital: More screens, more revenue. When talk of highly profitable digital businesses comes up these days, 100-year-old sports companies don’t normally get mentioned. But there is at least one sports institution that has made a killing in digital: Major League Baseball. Back in 2000, the MLB solicited $1 million from each team in the league to jumpstart its foray into digital. Two and a half years later, they no longer needed that help. Today Major League Baseball Advanced Media brings in $500 million annually. How did they do it? By putting as much content on as many screens as possible. Professionals program and that a new one, the Google AdWords Certification program, will be taking its place. Publishers and brands are falling all over themselves to create products for the iPad. Considering that the new device is seen as a potential savior for paid content, that makes sense. But is the iPad ready to deliver on that promise? So far iPad users are purchasing content from the iTunes store. But they’re also swiping free stuff. For brands looking to invest in developing paid products for the new device, that money might be best spent elsewhere.